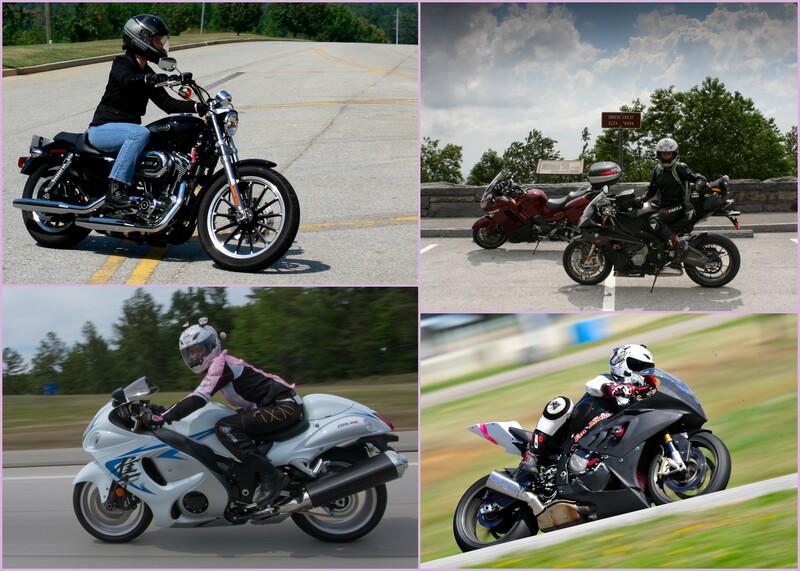 Profile of a Female Motorcyclist: Meet Em Alicia a.k.a. Miss Busa | Helmet or Heels: I'm comfortable in either! I “met” this next gal in cyber space. I was new to riding, Twitter, and blogging but somehow found dear Em Alicia from Augusta, Georgia. Right now I feel like a preschooler (my motorcycle skill level) trying to introduce a rider with a PHD in all things motorcycle. Find Em Alicia or @MissBusa on Twitter. She also has a blog filled with stories of her adventures in riding, The Girl Gets Around. And check out her Facebook Team PLD Racing page! This gal has some skills! How long have you been riding a motorcycle? I bought my first scoot in September of 2008, so 3 years 7 months. How did you learn to ride? My husband taught me the basics in two sessions. Halfway through the second outing, he sent me out into traffic. I made him follow me in the car to “watch my six” the next day I started riding to work by myself. I had to wait to take the MSF Basic Rider Course, but I got lucky and several cancellations enabled me to take it a month after buying my bike. What was your first motorcycle? The first motorcycle I have ever ridden was a Kawasaki GPZ900R, the very first generation Ninja. The first bike I’ve owned was a 2008 Harley Davidson Sportster 1200 Low. How many have you owned? Four. After seven months on the Sporty, I bought a 2009 Suzuki Hayabusa. Eleven months later, after having wrecked the ‘Busa, I decided to throw my leg over a 2010 BMW S1000RR, which is the bike that I currently ride. I also own a dedicated race bike, a 2007 Yamaha R1. Why did you want to ride a motorcycle? I was bitten by the bug riding on the back of my boyfriend’s GPZ900R. The dude was a maniac on two wheels. I was scared, but for some odd reason I thoroughly enjoyed the mix of fear and exhilaration. I wanted to learn to ride myself! However, my dad found out about my hooligan endeavors when someone caught me practicing figure 8s in the school parking lot and put a stop to the “nonsense”. He said he’d rather kill me himself then let me go through with it and wait for me to do it myself on a bike. He rode when he was younger, I really didn’t understand. But I was young and had no money to speak of. The decision had been made. Life happened and eventually motorcycles were forgotten until 19 years later, when the opportunity presented itself again in the form of needing my own vehicle to get to a new job; the need of learning to ride was revived. I always dreamed of owning and riding a true American Legend and since I thought I was too old for speed, I opted to go ahead and buy that Harley. A kind of big deal for this German girl. Tell us about your riding. My bike is how I get around; I even raced it until my husband surprised me with an early birthday present: a dedicated race bike with all the performance upgrades this girl could possibly want. I commute year around, and ride every chance I get. I am a combat commuter, superbike sport-tourer, knee dragger, part-time drag queen, speed freak with land speed record aspirations, and am learning to turn my own wrenches. I would also like to get into flat tracking … one day. For the women who are thinking about learning to ride: Take a safety course, like the MSF Basic Rider Course, even if you are unsure if motorcycling is for you. The class is fun, you learn the basics of motorcycling in a safe and controlled environment and you will know by the end of it wether or not you like riding. Don’t ever let anyone pressure you into something you are not comfortable with. Learn at your own pace and expand your comfort zone on your own terms. Educate yourself from respected sources, such as skill books or participate in formal training such as rider clinics and even track schools. Your education, protective gear and level of riding skill is your only line of defense out there. Always wear your gear and ride in traffic like you’re invisible. Oh, and buy used! Your first bike should be something that is not too expensive and you are not afraid to drop and break something. You won’t know what kind of rider you are going to be, so don’t invest too much money in your first ride, you might find out two or three months down the road that the bike you bought just isn’t doing it for you for one reason or another. What is the longest trip that you’ve taken on your cycle? The longest solo trip that I ever took was from my house to Deals Gap, to engage in a weekend of Dragon Slaying with the Women’s Sportbike Rally, which is held annually at Deal’s Gap. That’s about 240 miles one way. The longest trip was with my husband who rides a 2009 Kawasaki Concours 14: Augusta, GA ~> Barber Motorsports Park; Leeds, AL for the Kevin Schwantz Racing School ~> Cherohala Skyway ~> Blue Ridge Parkway ~> Skyline Drive ~> Myrtle Beach, SC ~> Augusta, GA. 1824 miles in 11 days. I learned to race, we stopped a lot and laid around on the beach. It was the most fun I’ve had since skiing Black Diamonds in West Virginia. Do you belong to any motorcycle groups? I am a member of the AMA. I belonged to the BMW RA for one year, but didn’t see the point. I joined a local chapter of the Southern Cruisers, a riding club that doesn’t charge membership dues, but never actually made it to one of their meetings. I really don’t get the club thing, and I don’t like to pay money to belong. I’m not really a group rider, not to say that I can’t behave myself in a group, but I prefer to do my own thing or ride with just a select few. I don’t feel comfortable around street riders whose riding style I’m unfamiliar with. I have trust issues on the street and if you find me in a group, I’m usually in the back of the pack, riding sweep. Do you have a favorite riding story? It is hard to pick just one. Any time you throw your leg over your machine you are risking exciting adventure. I think my all time favorite street riding story would have to be when I picked up my Hayabusa seven months into learning to ride. It is a three-day story of anxiety, nausea, elation, fear, adventure, excitement, and the awesome payoff that happens when you push your comfort zone a little and find you can do it, even though most people told you that you couldn’t (or shouldn’t). I’ll leave you with the link, if you would like to read how this Harley rider came to trade her classy V-Twin for 196 HP rocket sled. Check out the story here. What do you do when you’re not riding? I’m currently unemployed. I wish I could land myself a gig in the motorcycle industry, working with the one thing in my life that I’m extremely passionate about, would make me complete. That is my Zen. I also enjoy writing, poetry, image editing and graphic design, digital art, photo retouching and restoration, and running and I am constantly chasing that next adrenaline rush (endorphins are good, too). This entry was posted in Lady Riders and tagged American Motorcyclist Association (AMA), Blogger, BMW, endorsement, Female Motorcyclist, first motorcycle, Georgia, Harley Davidson, Kawasaki, Motorcycle Safety Foundation, riding, Suzuki, Twitter, women, Yamaha. Bookmark the permalink. Thank you again Pam for sharing these amazing stories. Now I have another to add to my blog roll. Thank you so much for your kind words. OMG! I’m blushing here. Pam just went above and beyond with that glowing intro. I am honored. And awed. I have yet soooo much to learn! But it’s certainly an awesome adventure to push our boundaries and comfort zones to become better riders; and see where we have been, how we have grown, and yet have so much still to look forward to on the (two-wheeled) journey ahead. Check out Pam’s blog, Helmet or Heels. Pam is a fellow lady motorcycle rider, and was kind enough to ask me to be featured in her new series: “Profile of a Female Motorcyclist” I am in awe that she would ask me to become part of such a great group of ladies who share one common bond, their passion for motorcycles and the ride! I too am bowing my helmet to Miss Busa! Way to Go!! Trob? are you on here somewhere?? Thanks Pam for getting the word out to the girls! What would our lives have been like without our bikes??? Think about that? I’m so glad I ride! I too am bowing my helmet to Miss Busa!! Way to go!! Trob are you on here somewhere? Thank you Pam for putting the word out to Girls! Can you imagine your life without riding? Think about it!!! Thanks Pam!!! I’m going to look now. Sorry about posting twice. Not used to WordPress. No problem. Glad to help you find your friend.